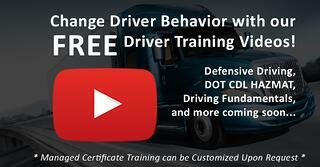 Welcome to our Driver Training Series! An effective safety program consists of many elements but key to every program is ongoing training. Whether introducing new safety concepts or simply providing a refresher, training can reinforce good habits and change risky ones. At Glostone Trucking Solutions, we are dedicated to our clients’ success through safety. Our specialized training covers Defensive Driving habits, Hazmat Driver Training, Driving Fundamentals, and much more. Below is our series of driver safety videos (7 of them are FREE to watch now) that any carrier can use to supplement their training program from owner-operator to large fleets. Want to take these videos even further? For those looking for a managed program that can include onsite, classroom, webinar, and video training, we offer a platform that can set up a custom program, track the program elements and measure for effectiveness! Let us know of your interest by filling out the form. Otherwise, enjoy the videos! Inspection: I'm Being Audited by FMCSA... Now What?